Let’s face it, summer’s over. We’ve become accustomed to a scorching fortnight in June, a mild July, a wet August, then, if we’re lucky, we get to taste the last of the summer wine in late September. Recently at Chichester Festival Theatre, we had cause to become weather obsessives. The Chichester Festival Youth Theatre was performing its site-specific version of Grimm Tales outside at Cass Sculpture Foundation in West Sussex. A total of 60 children, dressed as Tim Burton-esque urchins from the future, occupied the great outdoors of Goodwood to surprise us with grotesque, naughty, oh-so-dark morality tales of absent fathers, wicked stepmothers and overly curious children. Our producer Amelia had downloaded a variety of apps to keep tabs on the weather, and suddenly each one showed ominous blue-green blobs moving at speed over the south of England. The team huddled under umbrellas on the theatre’s forecourt deciding if the show really could go on. The torrential rain arrived at midday, and we felt we had no choice but to cancel the matinee. But what about the evening? The apps became our oracles: wind speeds, percentage chance of rain at each hour and direction of weather travel. Would the costumes survive? Would the audience survive? Did I remember my wellies? Yes, yes and yes. The evening show was going ahead. By the time I arrived at the ground, it was pouring with rain, but any misery was immediately lifted when three coaches arrived, packed with the audience. Cups of tea were shared, Rachel Tackley, our executive director, handed out transparent waterproof ponchos, the band struck up and we were off. The promenade nature of the performance meant that as Red Riding Hood’s story ended in one clearing, the band would lead us deeper into the woods for Hansel and Gretel. After that, Hans My Hedgehog – Grimm fairytale number 108 – was performed on a hillock where, for a brief moment, the apps’ promise of clearer weather seemed possible as we looked out across the South Downs. The reprieve was brief but our spirits were still high. The final story, The Juniper Tree (a tale of child cruelty, murder and cannibalism), was presented in front of a sculpture called Host by Peter Burke, made of 40 copper mummified human figures, which are as spooky as the story is gruesome. The young people were astounding. Despite the wind and the rain, which bucketed down at one point, and despite the flickering lighting at another point, their commitment and dedication never faltered. 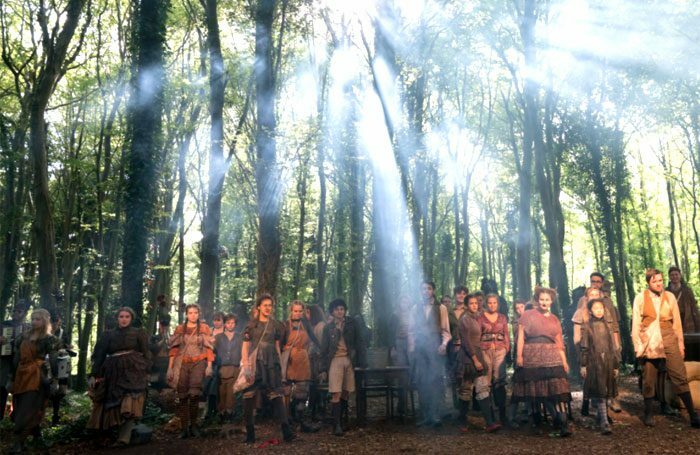 They possessed the woods as they performed their roles – and our audience was enraptured. I had a new-found respect and empathy for those who run theatres in the open air – and, indeed, for that particularly British spirit that would not let the weather deter us.